1734 Delft Lampetkan LP Kan Equestrian Figure Princess Anna of Orange 8 1/2"
Very few samples sold in the past at high prices. The mark is earlier than 1755, as the Brouwer family overtook the manufactory (Ris-Paquot). Titled in full « ANNA PRINCES VAN ORANIE » in underglaze blue on the front of the base. NUMBER: E4. If an item is listed like USED it can be dirty. Be sure you will receive your item in a condition as it is described. 18th or early 19th Century example. Excellent condition, with two small flakes on the brim of his hat - otherwise fine. Maker's Mark "D" or "O" Carved in Bottom Hand Painted Porcelain Each is Approx. 15" Tall x 4" Diameter Very Good Condition: There is a glued repair on the male statue- the bouquet he's holding has been reattached. Otherwise there are other minor signs of cosmetic wear as expected with age and previous display including faint surface marks, light dustiness, and felt remainders and gentle shelf wear to bottom; no other chips, or cracks besides the repair. Please check the detailed photos! W3. The amazing thing about it is, it's as perfect in condition as one could wish for. 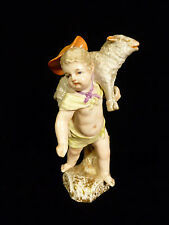 The candle holder modelled as a cornucopia with the delightful putto holding a sheath of wheat. Rare Antique Blue & White Bisque Pottery Plaque w 18c Political Satire IN EXCELLENT CONDITION! This wonderful plaque is a genuine antique and dates to the 1700's. It is a superb example and features a political satire entitled "A Sharp Between Two Flats". The item is marked “Hochst” with a six spoke wheel to the underside. Very good condition. Otherwise fine. The compote has a reticulated, lace-like board and stand with encrusted flowers. In 1708, Johann Friedrich Böttger and his team discovered the secret of the porcelain production, arcanum. Russian Tsarina Catherine II seizes power, declaring herself sovereign ruler of Russia. The Chelsea Porcelain factory was the first important Porcelain factory in England. 6 1/2" tall. It has no crazing. It depicts a young woman in classical dress weeping at a funerary urn, symbolizing grief. It is 9.25 " (235mm) tall. I date it between 1780-1820 (sources differ on the dating). Ralph Wood II of Burslem (Staffordshire) is the most likely maker of this piece. In 1708, Johann Friedrich Böttger and his team discovered the secret of the porcelain production, arcanum. 3 1/4" by 3 1/2" at the base and 7" tall. The lady is in a long Victorian gown. She has a lovely face with hand painted features. It has the blue "Y" mark under glaze used by the Foure' factory in 1742 and an impressed model number 59. Konigliche Porzellan-Manufakture. KPM was founded in 1763 by Frederick II of Prussia. Also included is a photograph of a contemporary piece with a similar loose base. Base is original and in good condition. 18th/19th Century Miniature English Staffordshire Table Dog Porcelain 5"
This is a mini English Porcelain Staffordshire Spaniel Table Dog. He is quite charming and primitive. The condition is fair -- he has a stress crack from his ear down to his elbow. See the final photograph. Signed with the underglaze blue scepter mark. The blue crossed swords and two lines through them reflects age of 1760’s and because it has an animal in it. Mark is known to symbolize creation date from 1730-1763. Girl Feeds Boyfriend Grapes. She carries basket of light and dark grapes and feeds him one as he sits on ground (probably a good thing since his hand is missing!). It has no cracks, a tiny chip on the bottom edge and a small chip on the glaze of the hat (see last two pictures for details). Rare English Antique 1752-1756 Early Chelsea Porcelain Sitting Poodle Figure NR! English, late 18th century. Standing on a rockwork square base. Glazed overall in green. 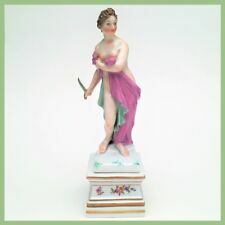 Made of hard porcelain in France byPorcelaine de la Courtille, established by Jean Baptiste Locré in 1773. A previous repair was done with brown epoxy to the base underneath where the lion sits. Overall excellent with minor wear on protruding edges, with no visible evidence of breaks or repairs on the porcelain. There just adorable and very old. as shown. if you can live with them. there fabulous. still they look very nice. If you have a valid California resale certificate and plan on using it when purchasing from us. It is made of a heavy hard paste porcelain with very intricate detail. There is such beautiful detail in her like the mouth and face, the hands holding the flowing scarf and the her feet with maple leaves on the pedestal. Would look so lovely In any area of your house. I personally had this by my vanity. Fit so well with my style. They bear the Chelsea (gold anchor period 1756-1769) gold anchor mark. It is a nice cute little poodle. The Chelsea Porcelain factory was the first important Porcelain factory in England. 4 1/2" tall and 4" by 2" at the base. Standing on a round plinth with a square base sponge painted in green and brown. The face details in brown and the shoe buckles in green. English, late 18th century. NUMBER: F21. If an item is listed like USED it can be dirty. SERIES: Garden Children. Be sure you will receive your item in a condition as it is described. OTHERWISE I WILL HAVE THE RIGHT TO CANCEL THE SALE ! All hand shaped unglazed brown terracotta. You never know what you might find! If you do not agree with any price, let us know your suggestion. Condition: Very Good overall,Pl ease see photos below. This mark was stamped in blue on a variety of pieces including decorative objects and tableware made in the second Capodimonte factory to be established in Naples by King Charles VII’s son, Ferdinand. African jerboa / afrikanische Springmaus. In April 1735 followed the model for the molding in porcelain. So he pulled the long, spoon-like widened tail between his legs and put it circular over his back so he would not break off. Early Blue Mark on Bottom Circa Late 1700's, Germany 1-7/8" Wide x 4.75" Tall Very Good Condition: Has a few minor signs of cosmetic wear as expected with age and previous display including a glued repair spot at the bell of the horn, some light staining from removed shelf adhesive on bottom, faint surface scratches, and gentle shelf wear to bottom. No other chips, cracks, crazing, or other major damages. Please check the detailed photos! W3. Antique Dresden?. 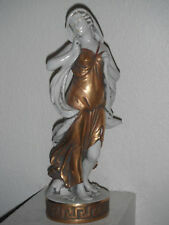 13” long, 7” tall, 5 ½” wide, has a crossed swords and the dot back mark. The owner was a collector and docent at the Atlanta History Center. One has a chip and hairline crack. 4" at Widest Point. The factory was founded by J. W. Hamann, c.1763. These areas are still the main focuses of production. Of course, the technology of raw material mixtures and firing procedures have changed. (The pictures are of the exact piece you will receive). Provenance : this was my mother's. The amazing thing about it is, it's as perfect in condition as one could wish for. Sèvres Biscuit Blue glazed Group - The School Mistress. Sèvres biscuit group representing "The School Mistress" after Falconet. The schoolteacher's group shows the latter seated on a bench surrounded by two boys, the hair held by a knotted scarf, dressed in a dress off the neckline and preparing to beat the boy to his left who, the head leaning against his hand, seems to have fallen asleep.The boy on the right tries to stop the gesture of the mistress by extending her hands towards the martinet. (I could not find any loss of lace or flowers). Modelled by Peter Reinicke and probably by Johann Joachim Kändler, circa 1744. Harlequin is standing before a tree stump in a dancing pose with his left knee and right arm raised and holding a slap-stick in his left hand.